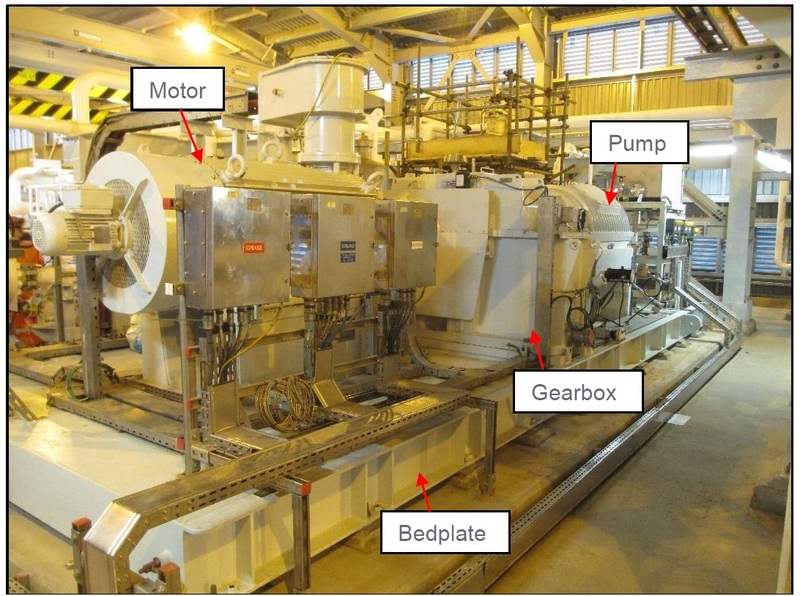 AVT was asked to investigate high vibration of a large electric motor driven pump, which was observed to generate high vibration levels exceeding the alarm level whenever the speed approached 70% of its design running speed. The arrangement comprised a large 250kW motor, a 4:1 step down gearbox and a large 5-cylinder double-acting positive displacement pump. Vibration measurements by AVT’s condition monitoring department confirmed excessive vibration levels of over 17mm/s at certain speeds, however the machine did not exhibit any signs of out-of-balance or misalignment. The problem was referred to AVT’s Asset Integrity division who suspected structural resonance of the machine bedplate, which was a large and significant structure approx. 8m x 3m x 0.4m secured to a large concrete foundation, by 11 No. holding down bolts along each side. 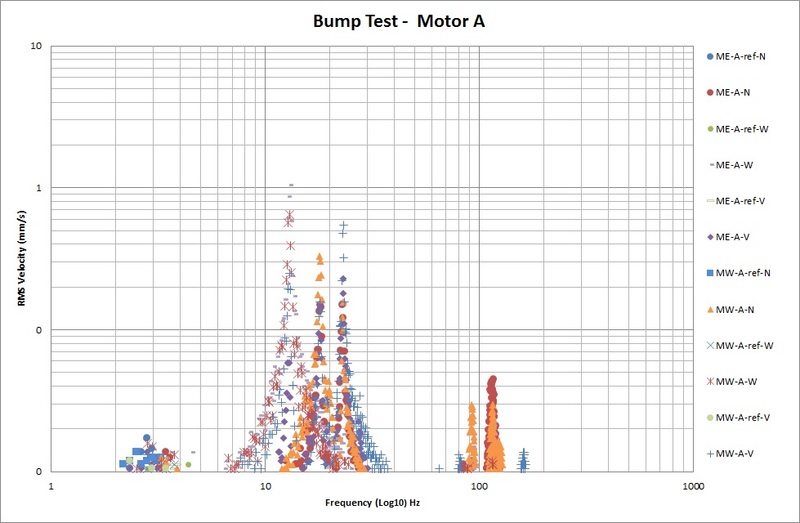 The bump tests confirmed several significant structural natural frequencies of the motor and gearbox within the range of operating running speeds of the machine of between 8Hz and 16Hz . Key frequencies on the motor were 13Hz, 18Hz and 24Hz and on the gearbox, key frequencies were 28Hz and 30Hz. 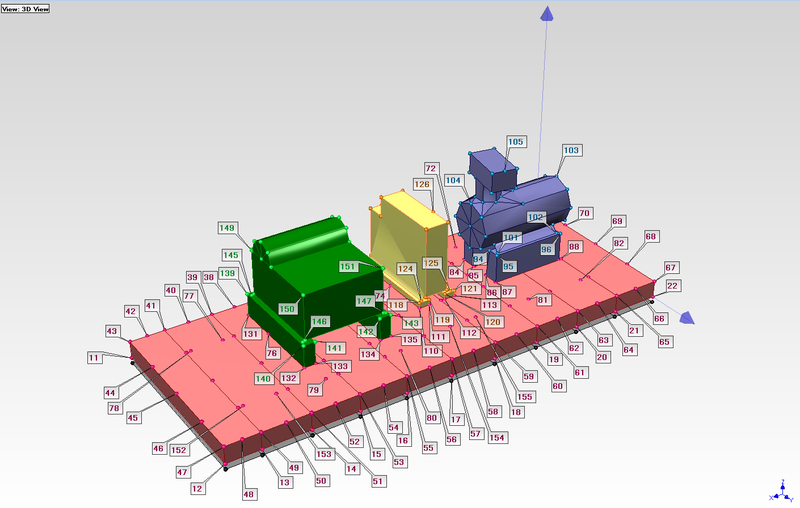 The ODS results were based upon measurements at 155 locations around the machine, bedplate and foundation. The assessment was repeated at 2 machine speeds, representing 70% and 76.5% of the rated running speed. It was not possible to run the machine at higher speeds due to the risk of damage resulting from the excessive machine vibrations. Although the bedplate looks to be substantial, the major items of machinery are actually each supported primarily by 2 No. cross beams connected between the 2 main side rails. These cross beams do not contact the concrete foundation and so are effectively simply-supported beams, free to deflect towards the centre by the application of any vertical loads. In the case of the motor, the observed motion is an out-pf-phase rocking of the vertical load between the 2 supporting cross beams. In the case of the gearbox, the observed motion is due to the differential stiffness between the centre of the cross beams and the stiffer connection close to the side rails. In terms of resonance, the primary motor vibration is due to frequency matching between the 1x motor speed as the speed approaches 12 Hz (> 70% of rated speed). The excitation of the gearbox at 30Hz corresponds to 10x the pump speed (gearbox speed reduction of 4:1, combined with 5 cylinder double-acting pump). To provide an effective permanent fix, AVT recommended stiffening of the whole baseplate using a 2-stage specialist grouting process. Firstly, the bulk of the internal cavity of the baseplate would be filled with cement grout and then secondly, high pressure injecting an epoxy grout to fill remaining voids in order to restore the connection between machine and foundation as per API RP 686. The reason for the additional epoxy grout is that, due to shrinkage, it is likely that hairline cracks will exist along most of the steel/cement grout interfaces, and also the interfaces between the new cement grout and the original concrete floor, resulting in a loss of stiffness. During high pressure injection, these hairline cracks will be filled with epoxy grout, resulting in a strong permanent bond between all parts and effectively raising the original concrete plinth up to the motor holding down bolt level. Following successful grouting by specialist grouting company Alphatec-Engineering Ltd, the measured vibrations on the machine are now below 1mm/s at all positions and at all running speeds.